A legume (/ˈlɛɡjuːm/ or /ˌləˈɡjuːm/) is a plant or fruit/seed in the family Fabaceae (or Leguminosae). Legumes are grown agriculturally, primarily for their grain seed called pulse, for livestock forage and silage, and as soil-enhancing green manure. Well-known legumes include alfalfa, clover, peas, beans, lentils, lupin bean, mesquite, carob, soybeans, peanuts, and tamarind. The term "pulse", as used by the United Nations' Food and Agriculture Organization (FAO), is reserved for crops harvested solely for the dry seed. This excludes green beans and green peas, which are considered vegetable crops. 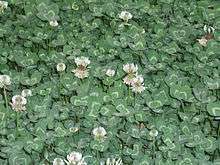 Also excluded are seeds that are mainly grown for oil extraction (oilseeds like soybeans and peanuts), and seeds which are used exclusively for sowing forage (clovers, alfalfa). However, in common usage, these distinctions are not always clearly made, and many of the varieties used for dried pulses are also used for green vegetables, with their beans in pods while young. Some Fabaceae, such as Scotch broom and other Genisteae, are leguminous but are usually not called legumes by farmers, who tend to restrict that term to food crops. Farmed legumes can belong to many agricultural classes, including forage, grain, blooms, pharmaceutical/industrial, fallow/green manure, and timber species. Most commercially farmed species fill two or more roles simultaneously, depending upon their degree of maturity when harvested. Grain legumes are cultivated for their seeds. The seeds are used for human and animal consumption or for the production of oils for industrial uses. Grain legumes include beans, lentils, lupins, peas, and peanuts. Legumes are a significant source of protein, dietary fiber, carbohydrates and dietary minerals; for example, a 100 gram serving of cooked chickpeas contains 18% of the Daily Value (DV) for protein, 30% DV for dietary fiber, 43% DV for folate and 52% DV for manganese. Like other plant-based foods, pulses contain no cholesterol and little fat or sodium. Legumes are also an excellent source of resistant starch which is broken down by bacteria in the large intestine to produce short-chain fatty acids used by intestinal cells for food energy. Preliminary studies in humans include the potential for regular consumption of legumes in a vegetarian diet to affect metabolic syndrome. There is evidence that a portion of pulses (roughly one cup daily) in a diet may help lower blood pressure and reduce LDL cholesterol levels, though there is a concern about the quality of the supporting data. Depending on the variety, Phaseolus vulgaris (a pulse) may be called "common bean", "kidney bean", "haricot bean", "pinto bean", "navy bean", among other names. Forage legumes are of two broad types. Some, like alfalfa, clover, vetch (Vicia), stylo (Stylosanthes), or Arachis, are sown in pasture and grazed by livestock. Other forage legumes such as Leucaena or Albizia are woody shrub or tree species that are either broken down by livestock or regularly cut by humans to provide livestock feed. Legume species grown for their flowers include lupins, which are farmed commercially for their blooms as well as being popular in gardens worldwide. Industrially farmed legumes include Indigofera and Acacia species, which are cultivated for dye and natural gum production, respectively. Fallow/green manure legume species are cultivated to be tilled back into the soil in order to exploit the high levels of captured atmospheric nitrogen found in the roots of most legumes. Numerous legumes farmed for this purpose include Leucaena, Cyamopsis, and Sesbania species. Various legume species are farmed for timber production worldwide, including numerous Acacia species and Castanospermum australe. Legume trees like the locust trees (Gleditsia, Robinia) or the Kentucky coffeetree (Gymnocladus dioicus) can be used in permaculture food forests. Other legume trees like laburnum and the woody climbing vine wisteria are poisonous. This arrangement means that the root nodules are sources of nitrogen for legumes, making them relatively rich in plant proteins. All proteins contain nitrogenous amino acids. Nitrogen is therefore a necessary ingredient in the production of proteins. Hence, legumes are among the best sources of plant protein. 3), making the nitrogen available to other plants, thereby serving as fertilizer for future crops. In many traditional and organic farming practices, crop rotation involving legumes is common. 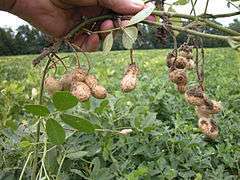 By alternating between legumes and nonlegumes, sometimes planting nonlegumes two times in a row and then a legume, the field usually receives a sufficient amount of nitrogenous compounds to produce a good result, even when the crop is nonleguminous. Legumes are sometimes referred to as "green manure". Archaeologists have discovered traces of pulse production around Ravi River (Punjab), the seat of the Indus Valley Civilisation, dating circa 3300 BC. Meanwhile, evidence of lentil cultivation has also been found in Egyptian pyramids and dry pea seeds have been discovered in a Swiss village that are believed to date back to the Stone Age. Archaeological evidence suggests that these peas must have been grown in the eastern Mediterranean and Mesopotamia regions at least 5,000 years ago and in Britain as early as the 11th century. 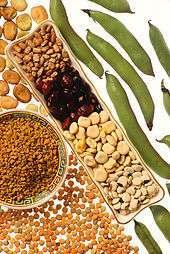 India is the world's largest producer and the largest consumer of pulses. Pakistan, Canada, Myanmar, Australia and the United States, in that order, are significant exporters and are India's most significant suppliers. The global pulse market is estimated at 60 million tonnes. The International Year of Pulses 2016 (IYP 2016) was declared by the Sixty-eighth session of the United Nations General Assembly. The Food and Agriculture Organization of the United Nations has been nominated to facilitate the implementation of IYP 2016 in collaboration with governments, relevant organizations, non-governmental organizations and other relevant stakeholders. Its aim is to heighten public awareness of the nutritional benefits of pulses as part of sustainable food production aimed towards food security and nutrition. IYP 2016 will create an opportunity to encourage connections throughout the food chain that would better utilize pulse-based proteins, further global production of pulses, better utilize crop rotations and address challenges in the global trade of pulses. Varshney, Rajeev K.; Kudapa, Himabindu (November 2013). "Legume biology: the basis for crop improvement" (PDF). Functional Plant Biology. CSIRO Publishing. 40 (12): v–viii. doi:10.1071/FPv40n12_FO. ↑ "What is a Pulse?". Pulse Canada. Pulse Canada. Retrieved 26 June 2016. 1 2 "Nutrition facts for Chickpeas (garbanzo beans, bengal gram), mature seeds, cooked, boiled, without salt, 100 g, USDA Nutrient Database, version SR-21". Conde Nast. 2014. Retrieved 15 January 2015. ↑ Birt, D. F.; et al. (2013). 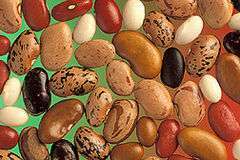 "Resistant Starch: Promise for Improving Human Health". Advances in Nutrition. 4: 587–601. doi:10.3945/an.113.004325. PMC 3823506 . PMID 24228189. ↑ Sabaté, Joan; Wien, Michelle (2015). "A perspective on vegetarian dietary patterns and risk of metabolic syndrome". Br J Nutr. 113 (Suppl 2): S136–43. doi:10.1017/S0007114514004139. PMID 26148917. ↑ Jayalath VH, de Souza RJ, Sievenpiper JL, et al. (January 2014). "Effect of dietary pulses on blood pressure: a systematic review and meta-analysis of controlled feeding trials". Am. J. Hypertens. 27 (1): 56–64. doi:10.1093/ajh/hpt155. PMID 24014659. ↑ Deacon, Jim. "The Nitrogen cycle and Nitrogen fixation". Institute of Cell and Molecular Biology, The University of Edinburgh. Retrieved March 1, 2015. ↑ Postgate, John (1998). Nitrogen Fixation (3rd ed.). Cambridge University Press. ISBN 978-0-521-64853-0. ↑ Smil, Vaclav (2000). Cycles of Life. Scientific American Library. 1 2 United Nations, David. "The International Year of Pulses". United Nations. Retrieved 14 December 2015. ↑ "International Year of Pulses 2016 - IYP2016". Retrieved 14 December 2015. Look up legume in Wiktionary, the free dictionary.